On July 6, 2018, President of the Republic of Uzbekistan Shavkat Mirziyoyev, at the invitation of the President of the Republic of Kazakhstan Nursultan Nazarbayev, visited Kazakhstan and took part in a solemn event dedicated to the 20th anniversary of the city of Astana. The President of the Republic of Uzbekistan Shavkat Mirziyoyev, accompanied by the President of the Republic of Kazakhstan Nursultan Nazarbayev, visited Astana International Financial Centre. Conditions created for business people, plans for the future have been presented. The Centre’s activities are based on the experience of international financial institutions. Tax privileges for up to 50 years, simplified visa, currency regimes and other preferences will be provided for participants of the Centre. Today, a solemn event timed to Astana’s 20th anniversary will be held in the Palace of Independence. This has been reported by the Press Service of the President of the Republic of Uzbekistan. The solemn event dedicated to Astana’s 20th anniversary was held in the Palace of Independence, in the capital of Kazakhstan. The President of the Republic of Uzbekistan Shavkat Mirziyoyev attended the event at the invitation of the President of the Republic of Kazakhstan Nursultan Nazarbayev. As reported by the Press Service of the President of the Republic of Uzbekistan, Shavkat Mirziyoyev sincerely congratulated people of Kazakhstan and President Nursultan Nazarbayev on this historic date. Astana is a bright symbol of a new, dynamically developing and independent Kazakhstan. Modern architecture, rich culture and traditions of people of Kazakhstan are harmoniously combined in Astana. This city is a platform for holding important international meetings, a major economic and financial center, said Shavkat Mirziyoyev. As is known, on July 6, 1994, the Supreme Council of Kazakhstan adopted a decision on moving the country’s capital from Almaty to Akmola. According to the decree of President Nursultan Nazarbayev of December 10, 1997, the city of Akmola was officially declared the capital of the Republic of Kazakhstan. On May 6, 1998, Akmola was renamed to Astana. In accordance with the law adopted in 2008, a state holiday was established – the Day of the capital, celebrated on July 6. Over the past period the territory of the city has expanded significantly, modern buildings have been erected. Astana has become not only a political, but also an economic, social, cultural center of the country. Regional and international events are held here. Thus, the capital of Kazakhstan hosted the Asian Winter Games of 2011 and EXPO-2017 international specialized exhibition. Presidents of Uzbekistan, parliamentary and governmental delegations of the country visited Astana several times. President Shavkat Mirziyoyev paid a state visit to Astana on March 22-23, 2017. The Head of the state also took part in the summits of the Shanghai Cooperation Organization and the Organization of Islamic Cooperation, which took place in this city. Shavkat Mirziyoyev, at the international conference “Central Asia: one past and a common future, cooperation for sustainable development and mutual prosperity”, held in November 2017 in Samarkand, forwarded an initiative on organizing a meeting of the heads of states of the region. Official Astana was one of the first to support this initiative. On March 15 of this year, the first consultative meeting of the heads of states of Central Asia was held in Astana. The events on the occasion of the 20th anniversary of the city of Astana have become another reason for a sincere exchange of views. The President of the Kyrgyz Republic Sooronbay Jeenbekov, the President of the Republic of Tajikistan Emomali Rahmon also took part in the jubilee. The arts masters of Uzbekistan performed songs and dances at the solemn ceremony. The festive event became another embodiment of friendship and cultural affinity of people of the two countries. 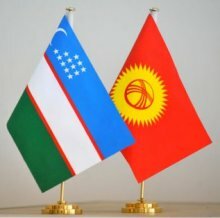 On July 6, the President of Uzbekistan Shavkat Mirziyoyev met with the President of Tajikistan Emomali Rahmon in Astana. At the meeting, issues of development of cooperation between the two countries were discussed.